In the southwest London borough of Kingston upon Thames, police officers were left giggling at the sight of walking traffic cones early last Sunday morning. The police file even read: "Males dressed as traffic cones, blocking the street like traffic cones." However, the Evening Standard has revealed that the act isn't just a drunken parade, rather a protest against Über car service. At 4:33a.m., Kingston police were called to investigate the peculiar sighting: five men in costume blocking a road. 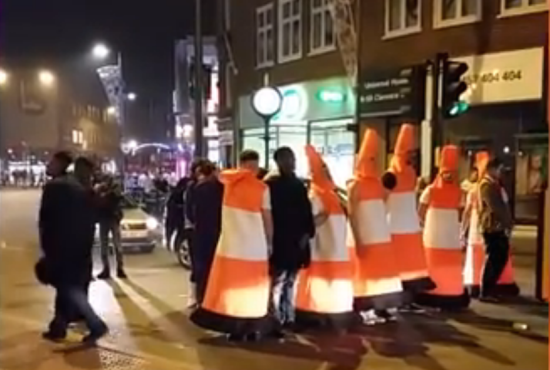 These are standard Saturday night antics in the hipster-ridden suburbs of London, however, what was odd was that the men were dressed up as traffic cones. It was Halloween, after all. Even more surprising is that the stunt wasn't even in the name of the "banter" (a timid excuse used by drunk Brits to do stupid, often distruptive things). Instead, it was a protest against the Über car service whose history of traffic-cone incidents is unknown. A vast array of traffic-cone outfits can, of course, be found on eBay. "They were just standing in front of the taxi and the bus not letting them get past and taking pictures of themselves," witness Dan Theocari said, speaking to the Evening Standard. "I didn't actually see the police, I was waiting for a taxi but I saw it and it made me laugh." https://twitter.com/MPSKingston/status/660751970907594752?ref_src=twsrc%5Etfw Police have since described the incident as "very interesting." This isn't the first time such a stunt in the UK has happened. This Halloween, men dressed in similar traffic attire caused commotion on the streets of Glasgow in Scotland, a video of which can be seen below.